The Youth Commission of the National Trade Union Confederation of Moldova (CNSM) organized on November 12 a roundtable called “We are young. We want safety in the future!” with the participation of the CNSM leadership and young trade unionists within the national-branch trade union centres. This was the start of the National Youth Week, marked in our country during November 12-18, in the course of which there will be several events focused on the socio-economic problems currently faced by young people in our country. 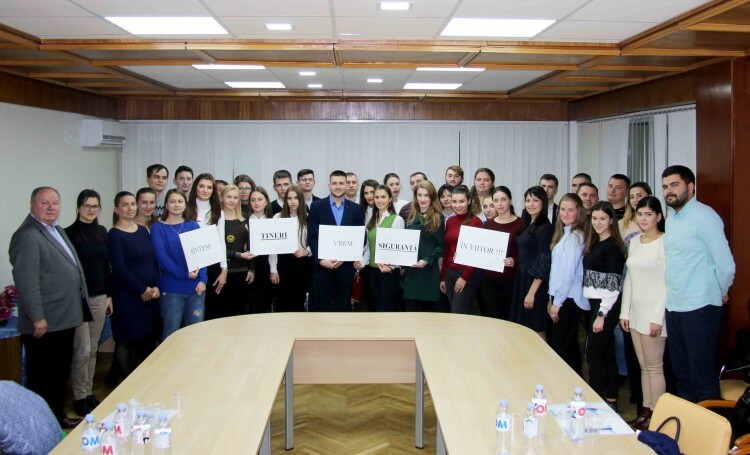 Petru Chiriac, vice-president of the CNSM, noted that the young people represent more than 25 percent of the total number of trade union members in the country, which is an enormous potential for the development of the trade union movement. He stressed that the young trade unionists are actively involved in the process of promoting democratic values ​​based on human rights, making projects for young people, helping to promote the image of trade unions and recruiting new trade union members, assuming an important role in the sustainable development of the country. Elena Stoica, president of the CNSM Youth Commission, provided information on the Commission’s work to achieve the CNSM Youth Strategy for 2018. In this context, she mentioned that the activities of the young trade unionists were synchronized with the main areas, activity, objectives set by CNSM. In particular, Elena Stoica pointed out that the Youth Commission organized several events during the launching and running this year of the CNSM National Campaign “The collective labour agreement – the guarantee of your rights”, during which the trade union youth discussed the terms of the collective agreement, have insisted on respecting them, have come up with ideas on supplementing benefits and guarantees for young people. The series of events organized by the Youth Commission of the CNSM in the context of the National Youth Week will continue with several educational activities and promotion of the rights of young employees in a number of educational institutions in the country, as well as an information campaign with the generic “What do you lose by receiving salary in the envelope” in the Europe Square to alert young people on the need to combat the informal economy.